I thank you for being here this afternoon. This is first of many press briefings to come. As a reminder, this forum is two-fold. It provides an opportunity for me to inform you of the work of my Government. Secondly, it provides an opportunity for us to have discourse about the work of my Government. As you know I recently returned from Barbados and Canada attending two important conferences. This afternoon, I want to share some information with you about BVI’s presence at the 36th Regular Meeting of the Conference of CARICOM Heads of Government in Barbados and the International Economic Forum of the Americas in Toronto, Canada. I will first speak about my trip to Barbados. During the CARICOM Heads of Government meeting, I had the opportunity to be updated on many of the pressing issues affecting our region. Among the issues discussed were the establishment of the Caribbean Centre for Renewable Energy and the creation of the Caribbean Energy Fund. This Caribbean centre would serve as an implementation hub for sustainable energy efficiency activities and projects in the region. It will be used to channel and coordinate efforts to assist economies with transitioning from fossil fuel to renewable energy. The energy fund, on the other hand, is designed to support the transformation of the Caribbean communities’ energy sector away from fossil fuel. Additionally, the forum provided an opportunity for Heads of Government to exchange views with the Secretary General of the United Nations, Ban Ki-moon as the United Nations prepares to launch a new global development agenda focused on Sustainable Development, in September. This agenda is important for the Territory as the Sustainable development goals (SDGs) will highlight the challenges of Small Island Developing States (SIDS) in addressing their social development needs, and their ability to build economic and environmental resilience as key elements to sustainable development for SIDS, such as the BVI. The BVI also used the opportunity to discuss with Caribbean leaders, the decision taken by the European Commission to place a number of Caribbean countries on a list of non-cooperative tax jurisdictions. Heads of Government agreed that this decision was done without merit, and was done outside of the internationally agreed body empowered to set international standards on Tax cooperation. CARICOM Heads of Government have called on the European Union to withdraw the listing. The conference also discussed the role of Caribbean Universities in building resilience and wealth creation to support Caribbean Development. The new Vice-Chancellor of the University of the West Indies, Sir Hillary Beckles in a presentation to Heads of Government outlined the work being done at UWI and other Caribbean Universities to put greater emphasis on Science and Technology, for the purpose of fostering greater industry and academic linkages. This is being done in an effort to strengthen the region’s indigenous capacity to foster innovation, competitiveness and resilience, within the Caribbean workforce. As a part of this strategy, greater emphasis will also be placed on promoting greater networking among Caribbean Universities and tertiary education institutions, internationally. I will turn to my trip in Toronto, Canada. Between July 8 and 10, I attended the International Economic Forum of the Americas – Toronto Global Forum after having accepted an invitation from conference organisers to be part of a panel of Caribbean leaders. We discussed the challenges facing the Caribbean community in having a shared vision for the Caribbean. The Toronto Global Forum is a non-profit organisation fostering dialogue on national and global issues. It is held under the auspices of the International Economic Forum of the Americas (IEFA). IEFA organises annual summits bringing together heads of states, central bank governors, ministers and global economic decision makers. The forum attracted over 2000 participants and 80 speakers and was held under the theme: “Creating Opportunities in a Connected World”. I shared this panel with the Prime Minister of Grenada - Dr. the Honourable Keith Mitchel, the Premier of Bermuda - Honourable Michael Dunkley, the Premier of Aruba - Honourable Michiel Eman and the Secretary for Economic Development Puerto Rico - Mr. Alberto Baco Baque. We had an engaging dialogue, discussing the Caribbean’s role in the economic development of the Americas, in light of the deepening relationships between the United States of America and Cuba. We discussed various issues in relation to tourism, air travel, self-sustainability and renewable energy. I was especially pleased to realise that as small Caribbean territories our concerns were essentially the same and that we all recognised the need to work together towards a common goal and to integrate with the outside world in a meaningful way. I was especially interested in this in relation to the effect that this would have in relation to two of our major Puerto Rico based banks doing business in the BVI, and their ability to continue to serve the people of this Territory into the foreseeable future. Aside from this panel discussion, I was able to attend quite a few discussions that ranged from international banking and finance to information technology and telecommunications. These discussions cemented in my mind the need for this Government to continue to push for significant advancement in policies that facilitate the improvement of our capability and use of information technology and telecommunications. 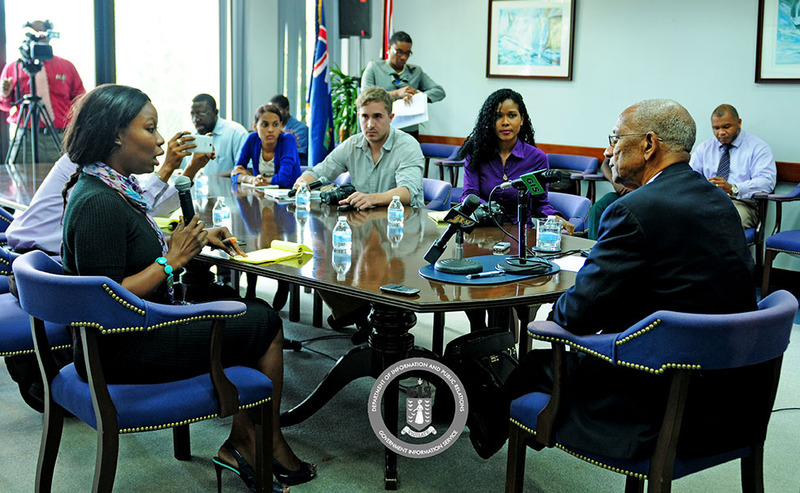 The discussions also cemented the utilisation of the cosmopolitan nature of our society to facilitate a strong and vibrant economy to improve the standard of living for our citizens here in the British Virgin Islands. Pursuant to these discussions I also held several bilateral meetings with several interests with a view to providing opportunities for better regional cooperation and the provision for economic opportunities for the British Virgin Islands economy. Finally I was able to meet and share a memorable evening with our BVI athletes who would be representing us in the Pan American Games, as well being present for the opening of the Games themselves on Friday, July 10. I was very pleased to have been able to participate in these events, and found the information received and relationships forged as having tremendous potential benefit to this Territory. As a Government, we will continue to do what is necessary to strengthen and build our international relationships so that Virgin Islands can further enhance its position in the regional and global economy. I now welcome your questions.